Apple is applying a technology that blocks off electromagnetic waves to iPhone 7. It is a measure to increase device’s performance while decreasing electromagnetic interference to major chips and to solve people’s fear on electromagnetic waves from Smartphones. According to industry on the 15th, Apple is applying EMI (Electro Magnetic Interference) Shield technology to variety of digital chips, radio frequency (RF), connectivity (wireless LAN, Bluetooth) chips and others that also include AP (application processor) and modems. Although it has been applying this technology to PCB (Printing Circuit Board) and connector, this is the first time when it is applying this technology to most of major chips. It has decided to use this technology due to interference in wireless communication and others as clock signals of digital chips have recently increased. When EMI Shield technology is applied, unexpected signals that happen due to electromagnetic interference can be prevented. Also circuit boards can also be assembled more elaborate. When mounting space between chips is decreased, areas that are left over can be used for batteries and eventually increase times that batteries can last. 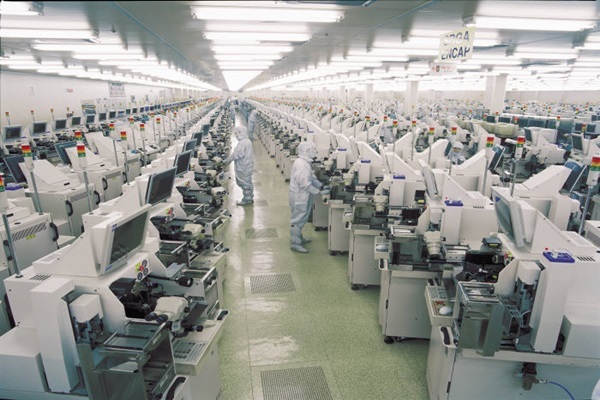 Major chips’ production costs will increase due to addition of new process. Apple has StatsChipPac and Amkor responsible for EMI Shield process on major chips of iPhone 7. EMI Shield process will take place in both businesses’ factories that are in South Korea. EMI Shield technology on semiconductor chips takes place by adding a process that covers surface of packaging with ultra-thin metal. Packaging businesses perform such process by using sputter that covers chips ultra-thin metal shield. Packaged chips will be loaded onto EMI Shield sputters, and handler equipment (unloaded) that takes out chip packages that are done with shielding process is also necessary. Competitive edges in sputters and handlers are stability, precision, and speed. They will be able to evenly sprinkle metals on top of chips for shielding. Handlers are also have to be able to load and unload chip packages on sputters fast and precisely. Apple first applied EMI Shield technology to major chip package ‘S1’ of Apple Watch that was released last year. To apply such technology onto major chips of iPhone 7, it has been doing development project with packaging businesses since last year. It is heard that Apple personally chose equipment partners during this process and had induced packaging businesses to give them contracts. StatsChipPac and Amkor have made many contracts with South Korean sputter and handler businesses for EMI Shield since end of last year. Contracts are worth more than tens of millions of dollars, and additional contracts will take place during first half of this year also. There are higher possibilities that other Smartphone businesses will also introduce this technology as Apple has introduced it.